Carlton Ware was a famous Stoke On Trent based pottery manufacturer established in 1890 and formed via a partnership between James Frederick Wiltshaw and brothers William H and James A Robinson, trading as Wiltshaw & Robinson. This gave birth to a company that lasted almost a century, albeit with several changes in ownership. They entered a highly competitive market which was already dominated by others and managed to become a market leader themselves. 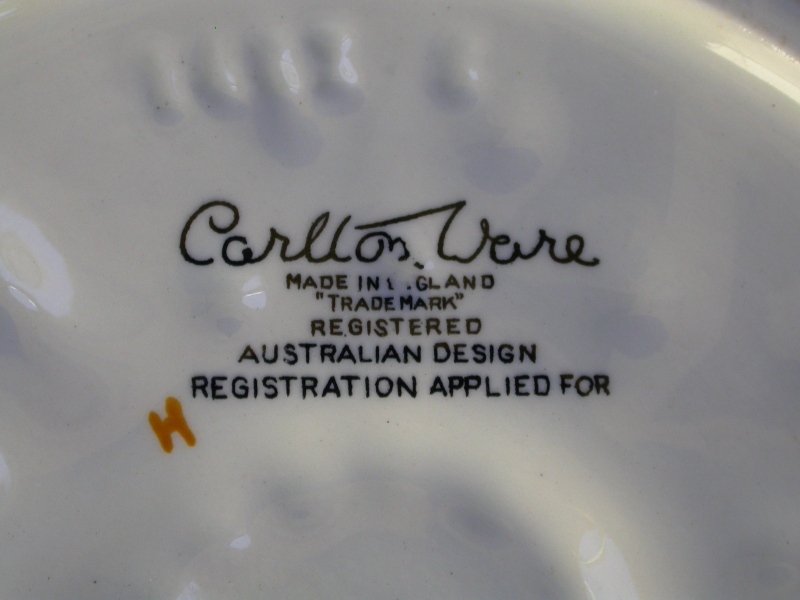 In 1894 the trademark �Carlton Ware� was introduced and the factory was re-named the �Carlton Works�. In 1911 Wiltshaw and the Robinson brothers had major disagreements and the partnership was dissolved, leaving the company solely to James Wiltshaw. Following the accidental death of James in 1918 control of the company passed to his son, Frederick Cuthbert Wiltshaw, who was to succeed in establishing the firm as a top quality manufacturer for the next half a century. By the mid 1930�s the Japanese had become masters of copying good quality wares and Carlton Ware became a target. Prices for the imitations were much lower than the originals they copied, which caused much concern. However, Cuthbert discovered a clause in the South East Asia Treaty Organisation (SEATO) between Australia and Japan where designs registered in Australia could not be copied by the Japanese. He quickly took advantage of this by registering a large number of patterns in Australia. This explains the �Registered Australian Design) backstamp on many of their patterns. The 1950�s were probably the most productive period for Wiltshaw & Robinson and in 1958 the company was renamed Carlton Ware Limited with Cuthbert Wiltshaw as Managing Director. In 1966 Frederick Cuthbert Wiltshaw died and in the following year the company was sold to Arthur Wood & Sons. The company continued to trade well, but with the recession in the early 1980�s was finally forced into receivership in 1989. There was an unsuccessful attempt between 1990 and 1992 to rescue the company, but to no avail. The name remained dormant until 1997, when Francis Joseph of the Carlton Ware design centre acquired it together with a number of moulds and a few pre-production models.